STILLWATER, OK (May 30, 2018) – Oklahoma State added to its historic legacy, and a new star was born. Matthew Wolff sank a 15-foot birdie putt on Karsten Creek’s 15th hole to clinch the Cowboys’ 11th NCAA Championship and first in more than a decade. The victory vindicated the Cowboys, who were so dominant this season that Golf Channel created a behind-the-scenes documentary devoted to the Cowboys’ quest for a national title. They won 10 times this season, including seven in a row, and were playing on their home course. 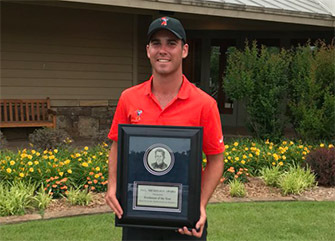 The Cowboys had two first-team All-Americans (Wolff, Viktor Hovland) and four of the nation’s top 35 players, including three of the top 15. Anything less than a victory would be a crushing blow for college golf’s powerhouse program. The NCAA Championship’s match-play format, which was instituted in 2009, rarely rewards the season’s best team, though. Match play’s unpredictability has allowed the championship to grow exponentially. The inherent drama made the championship appointment viewing even for those who’d otherwise have no interest in an amateur golf event. This one was no nail-biter, though. And the season’s top team ended up hoisting the trophy. The result was decided by the 15th hole of the second match as the Cowboy’s authored the most dominant performance in the NCAA Championship’s match-play era. It was fitting that Wolff was the one who won it, though. He was the star of the week as viewers were introduced to the charismatic freshman from Southern California who hits the ball prodigious distances with a whiplash swing that is all his own. In a game that craves any variance from the cookie-cutter swings and personalities that populate the elite levels, Wolff offers something different. Here’s a small sampling of some of the clubs he hit this week: a 3-iron from 290 yards on the downhill par-5 ninth, a 7-iron from 225 on the same hole and an 8-iron from 228 out of a downhill lie in the rough on the 14th hole. His unique swing was a hot topic on social media this week. He has an extremely weak grip and brings the club back with minimal rotation. At the top, his hands are high and the club is pointed well across the line. His left heel comes high off the ground, a remnant of his baseball days. Gankas gives lessons at Westlake Golf Course, a 5,000-yard, par-67 course about 30 minutes north of Los Angeles. Players hit striped range balls off artificial-turf mats on the night-lit driving range that backs up to the 101 Freeway. Wolff developed into one of college golf’s top prospects on that short, scruffy public course. Many think Gankas taught Wolff’s unique swing was molded by Gankas in a quest for maximum distance. The swing feels natural to Wolff, and now other players are mimicking it. “If I never saw my swing on video, I would think I took it back straight back and straight through,” Wolff said, a quote that echoes the words of another player with a one-of-a-kind swing, Jim Furyk. Now other players, including pros, are asking Gankas to teach them Wolff’s ways. Kang and Web.com Tour player Jonathan Ruiz are among those who have modeled their swings after Wolff. Wolff did with his play in his first season of college golf, though. The nation’s fourth-ranked player, Wolff was awarded the Phil Mickelson Award as the nation’s top freshman. He was the Cowboys’ low finisher in the NCAA Championship’s stroke-play portion (T7). He won two of his three matches this week, including a 4-and-3 victory over Davis Riley on Wednesday. “A lot of people say it’s trash and it’s weird,” Gankas said. “Matthew knows how good he is. He’s not insecure at all. So many of my guys say they want to swing like that. Oklahoma State head coach Alan Bratton loved it from the moment he saw it. He first heard of Wolff when another recruit mentioned he’d played an event where someone shot 61. “My ears perked up and I was like, ‘Who is that?’” Bratton said. It was Wolff. Bratton’s assistant coach sent video of Wolff from a junior tournament soon after. “I loved it right from the start,” Bratton said. “You can turn your back on him and recruit him. I recruit with my ears a lot. It makes a good sound when he hits the ball and it goes where he’s looking. That’s the only thing that matters about a golf swing. A dominant performance in the day’s final match set the stage for Wolff to complete the Cowboys’ first national championship since 2006. Bauchou, the reigning Canadian Amateur champion, scored the Cowboys’ first point even though he was playing in the final match. He shot a front-nine 29 en route to an 8-and-7 victory over Alabama senior Jonathan Hardee. Hovland won the Cowboys’ second point, beating Alabama’s Lee Hodges, 4 and 3. Hovland, a sophomore, won all three of his matches after finishing 11th in stroke play. This was the first time the No. 1 seed won the NCAA Championship, and the first time Oklahoma State had won at its home course and under the match-play format that was instituted in 2009. 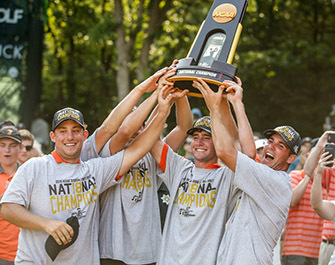 Oklahoma State also won the stroke-play portion in 2009 and 2010. They had fallen short in two previous NCAA Championships at Karsten Creek, finishing two shots behind Clemson in 2003 and losing to Augusta State in the semifinals in 2011. Not this time. The Cowboys provided the perfect ending for their well-documented season. “Once we saw the people and the cameras, I think that's when we stepped up and were able to play well,” Wolff said. Wolff is ready for the spotlight. He proved that this week.